1. Attachment parenting promotes mutual sensitivity. 2. Attachment parenting produces people who care. 3. Attachment parenting organizes babies. eighteen months – nine months inside the womb, and at least nine more months outside. The womb environment regulates the baby’s systems automatically. Birth temporarily disrupts this organization. Attachment parenting provides a gentle, sensitive, external regulating system that takes over where the womb left off. When a mother carries her baby, her rhythmic walk, familiar from the baby’s time in the womb, has a calming effect. When the baby is cuddled close to his mother’s breast, her heartbeat reminds him of the sounds of the womb. When baby is draped across mom or dad’s chest, he senses the rhythmic breathing. Being kept warm and held close, calms him and helps him control his reflexes. This high-touch style of parenting with its emphasis on keeping the baby comfortable has a regulating effect on the infant’s disorganized rhythms. Baby knows where he belongs. With his needs for food, warmth, comfort and stimulation receiving predictable responses, the attachment-parented baby is physiologically better off. A 1993 study from Virginia Tech compared sleep-wake patterns and heart rates of breast and bottle-fed babies. The breastfed babies showed more energy-efficient heart rates and sleep patterns. They were more organized. The researchers concluded: a baby who isn’t breastfeeding is like an engine out of tune. 4. Attachment parenting promotes quiet alertness. Both research and our own experience have demonstrated that attachment-parented babies cry much less. So what do they do with their free time? They spend much of it in the state of quiet alertness. During waking hours, babies go through many types of behavior: crying, sleepy, alert and agitated, and quietly alert. Babies are most attentive to their environment in the state of quiet alertness. By not fussing and crying, they conserve their energy and use it for interacting. The result is they are more pleasant to be with. Because a responsive parent takes time to enjoy the baby when he is in this state, the baby is motivated to stay in the state of quiet alertness longer. 5. Attachment parenting discipline promotes trust. Being in charge of your child is an important part of attachment parenting discipline. Children need to know that they can depend on their parents not only to meet their needs but also to keep them on the right path. Authority is vital to discipline, and authority must be based on trust. It is crucial for baby to trust that he will be kept safe. An attachment-parented baby learns to trust the one person who is strongly connected to him. When an infant can trust his mother to meet his needs, he will also look to her to help him behave. 6. Attachment parenting promotes independence. If you are wondering whether attachment parenting discipline will make your child clingy and dependent, don’t worry. Attachment parenting discipline actually encourages the right balance between dependence and independence. 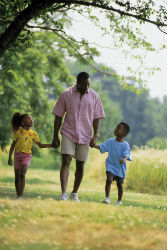 Because the connected child trusts his parents to help him feel safe, he is more likely to feel secure exploring his environment. In fact, studies have shown that toddlers who have a secure attachment to their mother tend to adapt easier to new play situations and play more independently than less attached toddlers. 7. Attachment parenting promotes intimacy. Attachment-parented kids have a look about them. You can spot them in a crowd. They are the persons looking intently at other persons. They seem to be genuinely interested in other people. I love to engage these children in visual contact because they are so attentive. The reason these kids look you straight in the eyes is they have grown up from birth being comfortable connecting to people, and they connect appropriately. Their gaze is not so strained or penetrating as to put off the other person; nor so shallow as to convey lack of interest. It’s just the right visual fix to engage people and hold their interest. Much of a child’s future quality of life (mate and job satisfaction) will depend on their capacity for intimacy. Therapists we interviewed shared that much of their time is spent working with persons who have problems with intimacy, and much of their therapy is aimed at reparenting their patients. Because connected kids grow up learning to bond with people rather than things, they carry this capacity for intimacy into adulthood. Many a nights I watched two-year-old Lauren inch over and snuggle next to Martha in bed. Even at this young age Lauren is learning a lifelong asset—the capacity for feeling close. 8. Attachment parenting discipline builds better-behaved brains. The developing brain of an infant resembles miles of tangled electrical wire called neurons. At the end of each neuron tiny filaments branch out to make connections with other neurons, forming pathways. This is one of the ways the brain develops patterns of association: habits, and ways of acting and thinking, in other words, organization. Attachment parenting discipline creates a behavioral equilibrium in a child that not only organizes a child’s physiology but her psychological development as well. In a nutshell, attachment parenting discipline helps the developing brain make the right connections. The unconnected child, however, is at risk for developing disorganized neurological pathways, especially if that infant has come wired with more than the average share of disorganized pathways. This child is at risk of developing behavioral problems later on, namely hyperactivity, distractibility, and impulsivity – features of an increasingly prevalent “disease” in childhood (and now adulthood) – attention deficit hyperactivity disorder (ADHD). A person’s brain grows more in the first three years than anytime in life. Could the level of nurturing during those formative years affect the way the behavioral pathways in the brain become organized? We believe it does, and we also believe that research will soon confirm that many later child and adult behavioral problems are really preventable diseases of early disorganization. 9. Attachment parenting helps you discipline the difficult child. This style of parenting is especially rewarding in disciplining kids we call high-need children. Sometimes parents don’t realize until their child is three or four years of age that they have a special child who needs a special kind of discipline (for example, a hyperactive child, a developmentally delayed child, or a temperamentally difficult child). By helping you shape your child’s behavior and increase your sensitivity to the child’s special needs, attachment parenting discipline gives you the right start that increases your chances of having the right finish. Connected parents have a head start in disciplining high-need children because they are sensitive to their child’s personality. The connected high-need child is easier to discipline because he is more responsive to his parents. One of the reasons temperamentally difficult children are difficult to discipline is they are disorganized. As we discussed earlier, attachment promotes organization. In fact, studies comparing the long-term effects of early parenting styles on a child’s later development show that attachment parenting discipline (or the lack of it) most affects the character trait of adaptability (the ease with which a child’s behavior can be redirected to the child’s and parents’ advantage). Adaptable children are better prepared to adjust to life’s changing circumstances. They learn to accept correction from others and eventually correct themselves. Some children are born puzzles. Attachment parenting discipline helps you put the pieces together. 10. Attachment parenting encourages obedience. The real payoff of attachment parenting discipline is obedience. To “obey” means “to listen attentively.” This style of parenting, besides opening up parents to the needs of their baby, also opens up the baby to the wishes of the parents. The universal complaint of parents is “My child won’t mind.” Think about this term “to mind.” What does it mean? As a child normally goes from dependence to independence and searches for an identity, the child minds his own mind. So, your child is minding, but he’s minding his own mind and not yours. How compliant your child is depends upon your child’s temperament, which you can’t control, and the depth of your parent-child connection, which you can influence. Because your minds mesh, the connected child is more open to accept your redirection and switch from his mindset to yours and to listen to you instead of being closed to you. The connected child trusts that his mother knows best. The attached child wants to please.